Eurocargo: for each use, the most suitable truck – thanks to a solid design, great manoeuvrability and a range that is unparallel. With Eurocargo, Iveco offers customers and fitters a custom made vehicle for any transport requirement in the middleweight sector. The secret of Eurocargo’s success is its versatility. 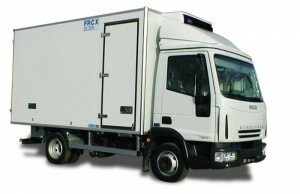 Eurocrgo is a benchmark in the category of medium commercial vehicles for its chassis. The structure (strong high tensile longitudinal steel beams) is without top of, and allows body lengths between 4.135 and 10.550 mm. This enables the Eurocargo to be easily adaptable for any type of mission : from urban delivery to construction site work, from goods transport to municipal services. Eurocargo is a commercial vehicle that was created to be profitable, reliable and long-lasting. For Iveco EUROCARGO ML75 we produce refrigerating customized containers. Contact us for all your information.